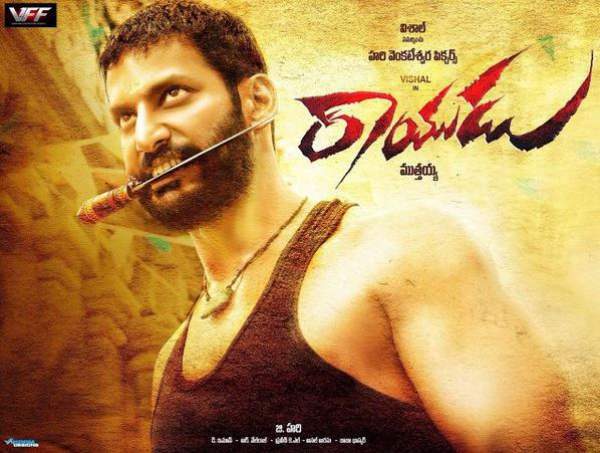 Rayudu is a villager who is always found involved in some fight. His actions and arguments leads his way in fights again and again. At some time, he gets involved in a fight indirectly with the president of the village. Apart from this fight scene, he loves his family very and gives equal importance to his work and family. Especially, he loves his grandmother and is always ready to do anything for her. In the meantime, he falls in love with Sri Divya and then marries her. Then, local thugs start terrifying them and keen on killing his wife, Sri Divya, but Rayudu always successfully saves her. Then, comes Marudhu in action. Who is Marudhu and why they wanted to kill both of them? How and why actually it started? It all forms the crux of the story. Rayudu is Vishal’s next movie after Kathakali. He has very well played the role of a rude villager. He loves his family and has shown every possible emotion towards the members. At the same time, he fought the goons to keep his family safe. Sri Divya is tasting the success of her recent movie Pencil. She appears to be on cloud nine. She has done to her character of a village girl to the full extent. Also, Radha Ravi has performed very well, and he has been an asset to the film. He portrayed the character of the antagonist. Other supporting star cast played their roles very well. The audience loved Soori for his epic comic timings. The first half has been excellent. Kalaipuli Leela essayed the role of Rayudu’s grandmother very well. TRT gives this film three stars out of five. Have you watched the film? What’s your Rayudu movie review? Don’t forget to share your views and thoughts with us.